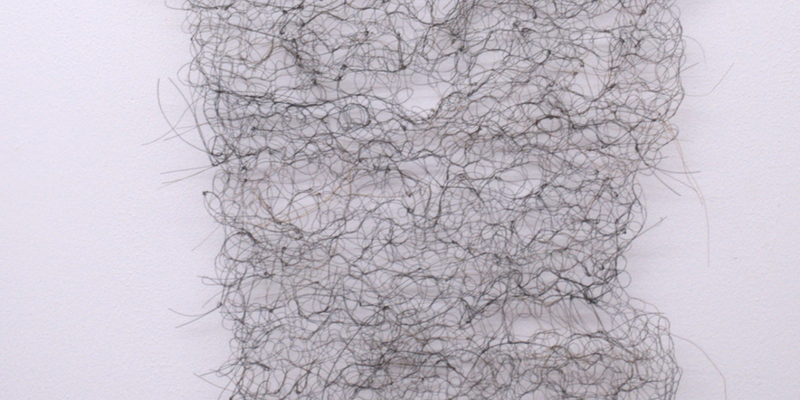 Pierrette Bloch, Untitled, 1980, horsehair, 16 x 9". Pierrette Bloch’s limited palette and gestures are as appealing as they are intransigent. The pieces on display here, dating from the early 1970s through 2014, highlight the late artist’s deep respect for paper and her lasting refusal to waste even the smallest of scraps. Among the most emphatic and arresting works on display is a group of minute drawings on long, thin strips of paper—part of an untitled series from 2009. Some are barely an inch tall, marked with innumerable strokes of ink, ink wash, and pastel. Her compositions belie any simplicity one might associate with line drawing. The deep concentration and intensity Bloch displays make the large-format late works by some of her male contemporaries, such as Pierre Soulages and Daniel Buren, appear decorative and unconvincing. Also on view are works that expand the terms of modernist painting. A patch of knitted horsehair (Untitled, 1980) and some inked and faded hemp loosely mounted onto a frame (Untitled, 1972) subtly insist that a picture is not a flat surface but a woven, textured one. While anticipating contemporary work by Channing Hansen and Tauba Auerbach, these objects form part of a canon of work by women artists active in the 1960s and 1970s, including Marisa Merz and Gego, that investigates the corporeal aspects of line.